This charming home/business is the last of several Queen Anne style houses that once dotted Main Street. 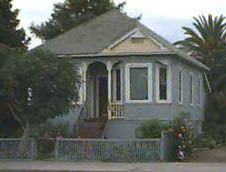 It was built by Joseph and Lucy Silveira in about 1899. The house later was owned by the Caudillo family for nearly fifty years. It once rested upon five foot tall posts which lifted it above the frequent flooding that struck Main Street during the winter rainy season as old Penitencia Creek overflowed its banks. Penitencia Creek once ran very close to the west side of Main Street prior to the early 1960s. Today, the house has been raised and a ground floor built under it for commercial offices. The restoration and adaptive reuse of one of our historic treasures should be credited to Ray Maglalang and his associates. In the days before WWII, businesses and residences were built intermingled. Stores, blacksmith shops, gas stations, even canneries could be found next-door to homes. Most people did not have to drive to the store or to work in those days, they just walked down the block. A main residential section of old Milpitas existed where the Calaveras Blvd. overpass is now located. 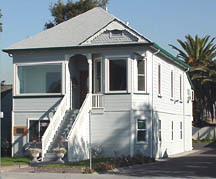 Although believed to have been moved to this site in the late 1940s from the city of Santa Clara where it was built, the Silveira/Caudillo House remains representative of a time when people in Milpitas lived near their work. The post-war effort to better assess property taxes based upon land use and to develop cities with more efficiently centralized services led to the re-zoning of much of the property along Main Street for commercial rather than residential use. This increased the value of the land and many homeowners sold their houses and lots to a commercial developer. This created the so-called “strip malls” - a half dozen or so commercial businesses occupying a single, long building which is setback from the street by an asphalt parking lot - now found along Main Street. From the early 1960s and into the 1980s this commercial design was considered attractive, desirable, and a sign that a city was modern. In the mid-1990s, city planners took a fresh look at mixed use development which places where people live closer to where they shop and work.